Social change is influenced by random as well as systematic factors, such as government, available resources, and natural environment. Social change is said to come from two sources: random or unique factors (such as climate, weather, or the presence of specific groups of people) and systematic factors (such as government, available resources, and the social organization of society ). The political-process theory emphasizes the existence of political opportunities as essential to the formation of social movements. According to this theory, the three vital elements of movement formation are insurgent consciousness (collective sense of injustice), organizational strength (in leadership and resources), and political opportunities (the receptivity or vulnerability of the existing political system). While this theory has been criticized for not paying enough attention to movement culture, it is also beneficial as it addresses the issue of timing for the emergence of movements. Political opportunities refer to the receptivity or susceptibility of the existing political system to challenge and change. Since this theory argues that all three components – insurgent consciousness, organizational strength, and political opportunities – are important for movement formation, it is able to address the issue of timing in the emergence of movements (i.e. why do movements form when they do). An extension of this theory, known as the political mediation model, considers how the political context facing a movement intersects with the strategic choices that the movement makes. pluralism: A social system based on mutual respect for each other’s cultures among various groups that make up a society, wherein subordinate groups do not have to forsake their lifestyle and traditions but, rather, can express their culture and participate in the larger society free of prejudice. resource-mobilization theory: Resource-mobilization theory places resources at the center of the emergence and success of social movements. In this case, resources include knowledge, money, media, labor, solidarity, legitimacy, and internal and external support from a powerful elite. Basically, social change comes from two sources. One source is random or unique factors such as climate, weather, or the presence of specific groups of people. Another source is systematic factors, such as government, available resources, and the social organization of society. On the whole, social change is usually a combination of systematic factors along with some random or unique factors. There are many theories of social change. Generally, a theory of change should include elements such as structural aspects of change (like population shifts), processes and mechanisms of social change, and directions of change. Political Process Theory, sometimes also known as the Political Opportunity Theory,is an approach to social movements heavily influenced by political sociology. It argues that the success or failure of social movements is primarily affected by political opportunities. Social theorists Peter Eisinger, Sidney Tarrow, David Meyer, and Doug McAdam are considered among the most prominent supporters of this theory. Political Process Theory is similar to resource mobilization theory (which considers the mobilization of resources to be the key ingredient of a successful movement) in many regards, and emphasizes political opportunities as the social structure that is important for social movement development. Political Process Theory argues that there are three vital components for movement formation: insurgent consciousness, organizational strength, and political opportunities. “Insurgent consciousness” refers back to the notions of deprivation and grievances. In this case, the idea is that certain members of society feel like they are being mistreated or that somehow the system they are a part of is unjust. The insurgent consciousness is the collective sense of injustice that movement members (or potential movement members) feel and serves as the motivation for movement organization. Political Process Theory: One of the advantages of the political process theory is that it addresses the issue of timing or emergence of social movements. 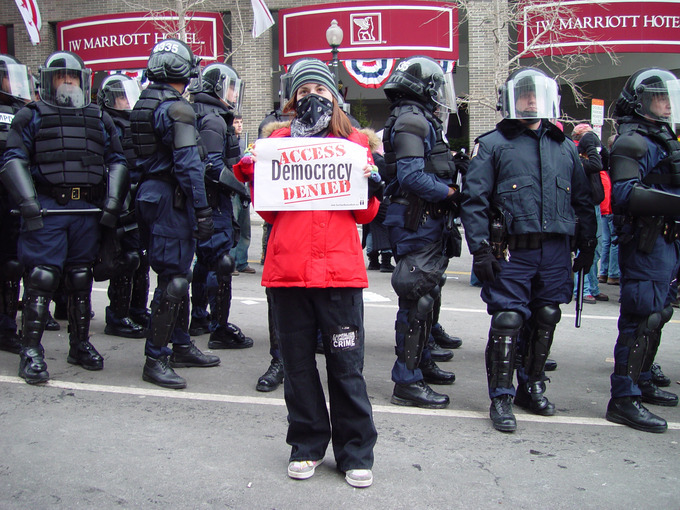 Photo taken at the 2005 U.S. Presidential inauguration protest. “Organizational strength” falls in line with resource-mobilization theory, arguing that in order for a social movement to organize it must have strong leadership and sufficient resources. One of the advantages of the political process theory is that it addresses the issue of timing of the emergence of social movements. Some groups may have the insurgent consciousness and resources to mobilize, but because political opportunities are closed, they will not have any success. The theory, argues that all three of these components are important for the successful creation of a movement. Critics of the political process theory and resource-mobilization theory point out that neither theory discusses the culture of movements to any great degree. This has presented culture theorists an opportunity to expound on the importance of culture.